Acchi aur sacchhi zindagi ka farak kya hai? This dialogue in the film, which means what is the difference between a good and honest life, forms the crux of the narrative. Designed as a sports film, it tells the story of two orphan friends, Ali and Maqsood, who are poor and want to make some quick money. Ali is excellent in gully cricket. But that is not what can feed him. Soon, after failed attempts as a salesman in a shop selling undergarments, he joins Maqsood as an extortionist, working for a local don addressed as Danger Bhai. During one of their extortion trips to a golf club, Ali effortlessly putts the ball, and a chance meeting with Kishen Lal, a caddy, who lives in his vicinity, introduces him to the game of golf. And the lure of fame, money and happiness in the eyes of his foster mother, is what keeps him hooked to golf. pulls all the plugs to give the film a mass appeal and that is why it probably works. Humour comes in the form of jokes, slapstick and situational comedy. The underdog characters, along with their rustic, lively dialogues, are what give a soul to the narrative. The pace is racy and the first half is quite entertaining. The second half suffers from narrative fatigue and formulaic overtures. 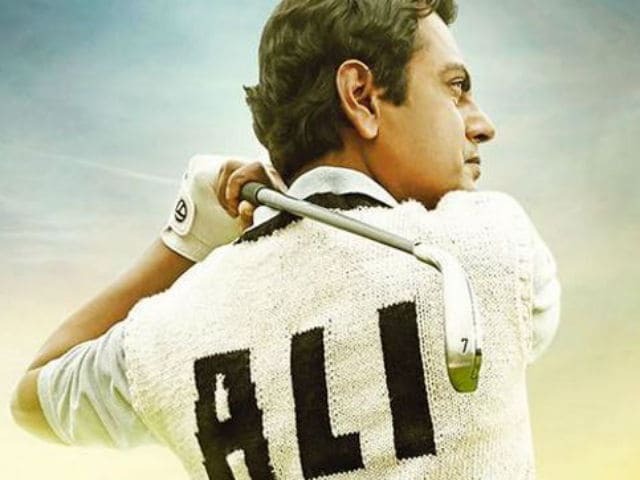 Nawazuddin Siddiqui in the titular role, as the unconventional golf player is convincingly sincere, that is because he does not deviate from being Ali. with negative traits is equally potent. Seema Biswas is also natural as Sulabha, their foster mother. But, her screech, uske pass ma hai, during the climactic scene on the golf course, seems conjured. Nikitin Dheer is charming as the duff and forever accident prone Danger Bhai. With his towering personality, baby face and a soft demeanour, he seems like a harmless clown. Asif Basra as Kishen Lal, Paresh Ganatra as Danger Bhai's lackey and Jas Arora as Vikram Singh Rathod, the reigning golf champion, have their moments to shine on screen. Amy Jackson is just there to up the glamour quotient, as Ali's manager and love interest. And, Jackie Shroff in a cameo is an eye-sore. The Sufi song, Parinda Hai, Parinda Hai, and the qawaali, Ya Ali Murtuza, are snugly ensconced into the narration. The background score is however loud and brash.